Riffling through some file folders last night, I happened upon an item that I evidently clipped out of Datamation years ago. It’s titled “Magic Moments in Software,” by Deborah Sojka and Philip H. Dorn. I can’t find a date on any of the pages, but internal evidence suggests it’s from the early 1980s. 1949—F. 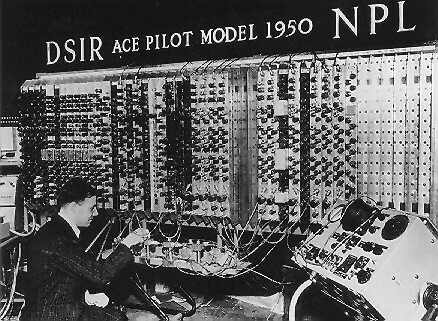 Fortesque Fingerhut, while trying to debug his first program on the ACE computer at the National Physical Laboratory, cannot find the problem. He cracks under the strain, disappears, and is not seen until 1981 when he reemerges as the net court judge at Wimbledon. All the other events recorded in this chronology seem to be genuine, and there’s no April Fool disclaimer at the end. Is it possible that the story of F. Fortesque Fingerhut is not a joke? Do you know what the first F stands for? suggests that the 1981 Wimbledon chair umpire, Bob Jenkins, famously overruled a linesman and called a John McEnroe ace out. Sojka, Deborah and Dorn, Philip H. Magic Moments in Software. Datamation 27:9 (1981 August 25), 8.
then it is more a kind of august fool joke. unless the paper were submitted by april 1st..
Had to be an August fool, the men’s final was played on July 5. I wonder what that first program did. Do you suppose this was a buzzer that made a loud sound, or one that delivered an electrical shock? Spam screening: Please enter the next element of the sequence shown. 1, 6, 21, 107, …?